The new XR75 DualX X-Ray system can detect contaminants as small as 0.4mm and significantly improves detection of low-density or soft contaminants, such as bones in poultry and products with overlapping pieces in a pack or bag such as fries, frozen vegetables and chicken nuggets, among other food products. The DualX X-Ray system analyzes two X-Ray signals – both a high and low energy – for a higher detection rate of low-density items, as well as foreign materials not previously detectable by standard X-Ray systems. DualX analyzes materials differences between organic and inorganic items to effectively detect soft contaminants such as stone, glass, rubber, metal and even poultry bones. The DualX takes QC and HACCP programs well beyond just metal detection by targeting the elimination of other dangerous foreign material in a high-speed production environment. Minimize false rejects with accurate and reliable XR75 DualX Dual Energy X-Ray Technology for food product inspection and contaminant detection. The XR75 DualX Dual Energy X-Ray system features Anritsu A.L.L. (Advanced Long Life) technology for critical system components. Long life, low-power components have been implemented, as well as an x-ray tube/generator and detector. This low-output generator reduces heat generation, eliminating the need for a cooling system and results in a reduction in power consumption. 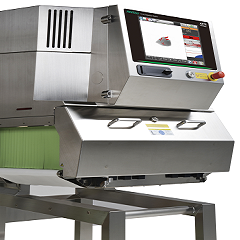 Overall, the XR75 x-ray inspection system can reduce lifetime operating costs, making food inspection more affordable. Standard features include HD imaging, tool-free belt and roller removal and an auto-learn product setup wizard. 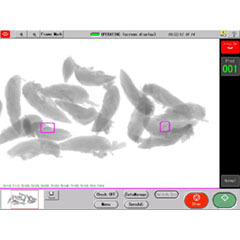 In addition, the dual energy system offers all of the other detection capabilities of an Anritsu X-Ray inspection system, including missing product detection, shape detection, virtual weight, count and package check, as standard features. For nearly half a century, Anritsu Infivis has been designing superior detection and inspection equipment for food, pharmaceutical and chemical packaging and processing industries. Across the globe, we provide a superior return on investment while ensuring your company is in compliance with the most stringent quality control programs. No other company can provide better support, experience and technology to detect contaminants or quality issues within your products. With more than 130,000 installations globally, and our development of strong quality control relationships with customers, Anritsu has a proven commitment to making food and pharmaceutical products safer at a higher level of quality assurance than competitors. Anritsu installations are successful because they are designed to be easy-to-use and easy-to-understand. 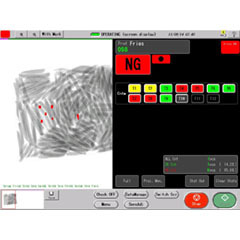 Rather than requiring complete knowledge of the technology, graphs and color-coded algorithm feedback provides operators with the information required to create new products and adjust existing settings with ease, eliminating the need for factory support. Reliability in the design minimizes the need for maintenance, but when required, a full suite of system diagnostics, plug and play boards and easy release conveyor design offers quick maintenance and minimizes any downtime.